Mohamed Abu Shadi, Egypt's new supply minister, speaks to the media at his office in Cairo, July 17, 2013. CAIRO — The biggest mistake deposed Egyptian President Mohamed Morsi made was stopping wheat imports, Egypt's new minister of supplies said, pledging to ensure that supplies of a strategic good like wheat do not reach the critically low levels they did during Morsi's year in office. Mohamed Abu Shadi, a 62-year-old former police general with a doctorate in economics, said Morsi's government made "incorrect calculations" regarding Egypt's wheat stocks. The estimates made by former supplies minister Bassem Ouda, who hails from Morsi's Muslim Brotherhood, were "based on guesses, not on facts," Abu Shadi told Reuters in an interview. When asked why Morsi's administration was unable to accurately assess its wheat stocks, a crucial issue for a country where much of the population of 84 million relies on heavily subsidized loaves of bread, Abu Shadi replied: "That was why he left." Abu Shadi said Egypt's current stocks of wheat were enough to last until Nov. 25 adding that after the arrival of 480,000 tonnes purchased this month, Egypt would have stocks to last until the end of the year. Abu Shadi said the military-backed interim government would aim to increase total stocks to between 5 million and 6.5 million tonnes by the end of Egypt's current fiscal year next June. He said the government currently had reserves of 3-6 million to 3.7 million tonnes of local wheat and 500,000 of imported wheat. Sworn in last week as part of the military-backed interim government running the country, Abu Shadi is in charge of regulating wheat stocks and dealing with the subsidized fuel and bread system that eats up almost a quarter of the state's budget. Egypt is the world's largest importer of wheat, but it froze its international purchase for months, from February until the eve of Morsi's overthrow on July 3, hoping for a bigger domestic crop. It was its longest absence from the market in years. Although it also grows its own wheat, Egypt still needs huge quantities of foreign wheat with higher gluten content to make flour suitable for subsidized bread. Abu Shadi ordered the purchase of 300,000 tonnes of Romanian, Ukrainian, and Russian wheat on Thursday, his second day in office. It dwarfed a July 2 tender of 180,000 tonnes ordered by his Morsi-era predecessor Ouda. Mamdouh Abdel Fattah, who managed Thursday's purchase, said days after Morsi's overthrow this month that Egypt was unlikely to buy wheat from abroad any time soon. Fattah is the vice chairman of the state grain buying agency, the General Authority for Supply Commodities (GASC). The agency typically announces tenders the night before they occur. The 300,000-tonne purchase was the new minister's first step to boost dwindling stocks of imported wheat that Ouda told Reuters on July 11 were only enough to last for two months. 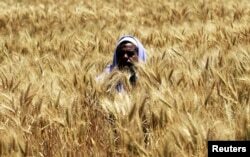 A farmer harvests wheat on a field in the El-Menoufia governorate, about 9.94 km (58 miles) north of Cairo, Egypt, April 23, 2013. Morsi's ousted government had said it would purchase 4 million to 5 million tonnes of local wheat but had only bought 3.7 million tonnes of home-grown wheat during the harvest which ended last month. Political turmoil and street violence since the January 2011 uprising that ousted veteran autocrat Hosni Mubarak have steadily driven Egypt into a deep economic crisis, scaring off investors and tourists and draining foreign currency reserves needed to secure critical imports like wheat and fuel. Abu Shadi said he was optimistic that the economy would begin to recover, saying this would come as the political and security situation stabilized, but did not give details on how the government would pay for his plans for rebuilding stocks. He said he did not have details of his ministry's budget, but said that a recent package of $12 billion in loans and grants from Gulf nations was enough to support Egypt through the transition, echoing similar comments by the new planning minister last week. Abu Shadi said he would work to boost next season's local wheat harvest, which runs from April to June, to reduce dependence on imports. But the minister said international purchases would continue. "We are open to everyone," he said, saying the government would "definitely" issue more tenders, though he did not specify when. He singled out Russia, one of Egypt's main wheat suppliers, saying that his ministry would speak with officials there "within days" to discuss price and payment facilities. Russia's Agriculture Ministry offered last week to hold discussions on possible humanitarian deliveries of wheat to Egypt. Abu Shadi dismissed that possibility: "No one gives a grant of wheat," he said. In his previous work as a senior official in the Supplies Ministry, he built a reputation for targeting theft and corruption in a subsidies scheme that is notorious for being abused. But the current state of the supply system shows that his efforts had limited success. Bread and fuel subsidies eat up more than 106 billion Egyptian pounds ($15.14 billion) annually. Despite his plans to purchase more imported wheat and increase local production, Abu Shadi did not reveal any parallel plans to clamp down on waste and losses in the supply system that could help to plug a budget deficit that has ballooned since the 2011 uprising. Admitting it would not be possible to completely stop fuel smuggling or corruption in the subsidized bread system, Abu Shadi said increased security measures were the answer to targeting "criminals". He pledged to "protect" the subsidies system for "those who need it", and said any reforms to the system would only happen after securing broad consensus from all groups with the consumers of the products being the priority. Reform of the broken system was viewed as a prerequisite to securing a $4.8 billion loan from the International Monetary Fund that Morsi's administration had sought this year. Months of talks ran aground with the government unable to agree to steep cuts to the unaffordable food and fuel subsidies. He also said the government would go ahead with a smart card system pushed by Morsi's government in an attempt to reduce the state's expensive energy bill, another step towards meeting the IMF's terms for the loan. "We will complete the system of smart cards... it will be the beginning of the citizen's right to obtain the quantities they want and after a period, we will determine the consumption amount for citizens."